Do you remember when you were younger and the excitement you had when you learned something new? That feeling when you were riding your bike and suddenly realised that there was no hand holding your seat anymore and you were zooming down the street all by yourself? Or the thrill of picking up those little books in kindergarten and seeing that you didn’t need to have someone read you a story, you could do it on your own? While these are my memories, we all have similar ones from growing up and feeling the excitement about becoming more and more free every time we jumped in and did something that we previously could not do. As we grow older, we can sometimes forget what this excitement of learning looks and feels like. But you only need to look at the face of child learning to ride a bike for the first time to remember the excitement. We were taught at a young age that knowledge is power and freedom. Don’t forget this lesson! Constantly focus on rekindling your spark for learning in order to claim your independence. We all have unique circumstances in our life that can either promote learning moments or not. How we use our powers of influence to capitalise on these circumstances affects our learning and our independence. Let’s take for example the case of Bored Bill. Bored Bill has worked in the same job for 10 years and does the exact same thing day-in and day-out. Bill would like to advance in his career, but his company will not pay for continued education or credentials, so Bill sees no other option than to remain where he is, bored out of his mind. Sitting across the cubicle from Bill in a cosy corner office is Crafty Chris. Chris started in the same job as Bill 10 years ago but since then has invested in his education by earning credentials that are important to his career path, as well as taking night classes to earn a degree in his field. Chris recently got promoted to manager of his division, and is stimulated and challenged daily by the work tasks that lay before him. When thinking about your learning goals, rather than focusing on your circle of concern (what you can’t control), focus on your circle of influence (what you can control). 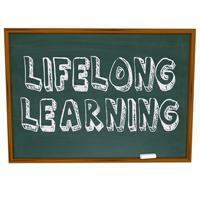 Learning is a very personal investment that will stay with you throughout your life wherever you go. So make sure to take responsibility of your learning goals and invest in them as you would any other valuable asset. One of my favourite quotes is from Vincent Van Gogh: “If you hear a voice within you say, ‘You cannot paint’, then by all means paint, and that voice will be silenced.” With my recent interest in the show Dancing with the Stars, a voice started to creep into my head that told me, ‘wow, those dancers are talented. You are way too uncoordinated to do that!’ And that is when I decided to start salsa lessons. In these weekly salsa lessons, as I learn new moves, I get excited at the realisation that I am getting better, and while I might be a way off from Dancing With the Stars status, I am much better than when I started. What internal voices do you have that keep you from learning something new? Sometimes you have to be really quiet to hear them, as many of these voices have been around for so long that they have become a belief system that we no longer question, but just take as fact, things like, “I’m not good at maths”, or “I have two left feet and could never dance well”. The thing about these statements is that they are self-fulfilling prophecies, because if you believe them you will never strive to improve. Take a moment to write down all of the negative self-talk that your sneaky subconscious has led you to believe. Then, on a new piece of paper, write the opposite, such as “I am awesome at maths” or “I can achieve Dancing with the Stars status”. If there is a learning goal you are going after, you first need to tell yourself that you are capable of doing it and then you will be. Claim your independence through learning today.